It's Christmas season and everyone is out, despite the weather. They are a happy lot, staring delightedly at the stores' window displays, enjoying the Christmas lights, just enjoying the season. The first few scenes introduce us to a host of characters - a man who seems to be enjoying the enjoyment of others; certainly, he is on the spot - to help a blind man across the street, even if he doesn't seem to think they have to stop for traffic; stopping a runaway pram before it falls off the sidewalk, just watching people. And we see a woman looking wistfully at a hat in a store window, but she smiles, shakes her head and moves away. Soon, she is at a store ordering her Christmas tree; she runs into an old man (Montey Wooley), a professor of history, who is bickering with the store owner over the price of one. But he knows the woman, whom he addresses as Julia (Loretta Young), and it is evident that they are very fond of each other. In fact, Julia cannot hide her distress, and the Professor tries to console her. As he stands looking after Julia as she hurries away, the first man is still watching them. In fact, he deliberately runs into the professor, and then claims an old acquaintanceship with him. The professor, not really knowing who he is, is a bit flustered. In fact, we are soon made aware that the man is a stranger to the town. Julia returns home, and we learn that she is the Bishop's wife - the Bishop, Henry Brougham (David Niven) was raised from Parson of St Timothy's parish to his present role as Bishop, thanks to the recommendation of the rich, and arrogant Mrs Hamilton (Gladys Cooper). Now, she wants her pound of flesh - the new cathedral that Henry is trying so hard to get built, will be sponsored by her as long as it is built according to her specifications. Or it will not be built at all! Henry Brougham has ambitious plans for a new cathedral, plans that depend on the whims and fancies of Mrs Hamilton. Endless business meetings and having to keep Mrs Hamilton happy has sapped the Bishop's morale. It has also strained his marriage and his relationship with his daughter. Julia is fed up, but she remembers to give Henry the old Roman coin that the professor gave her. Henry is not very grateful - what does the professor think he can do with it? As they sit down to dinner, the distance between the husband and wife is now more than the length of the dinner table. Overwrought, he prays for help and guidance when he hears a knock on the door of his study. When he opens the door, there is no one there. Puzzled, he turns back only to get a shock - there's a man in his study, the man who was watching people downtown. He is even more taken aback when the man mentions that he is an angel - 'No wings at the moment, but...'. Henry doesn't know what to believe. Dudley (Cary Grant) is amused - Henry, of all people, should accept the word of an angel. He, Dudley, has been sent because Henry is a good man, and his prayers have been heard. He is not a very important angel but he is here to help Henry. Henry has a tough time accepting the fact, but even he is shaken when he turns around from the door and finds that Dudley has vanished. Henry spends a sleepless night, but wakes up the next morning assuming it was all a bad dream. Until Dudley shows up, bright and cheerful and charming. Julia is happy to see Dudley too - he can take care of the office while she and Henry go out for their date. Unfortunately, Henry has to disappoint her. Again. Henry is conflicted - the cathedral must be built! But Julia is unhappy, and Henry hates to see her so. But he has to go to the meetings; the cathedral is too important a dream. Meanwhile, Henry has rushed back from his afternoon assignment, and is none too happy to find his wife missing. Back in town, Dudley and Julia have run into the Professor, who, by now, is very sure that he doesn't know Dudley at all! It is only when Julia tells him that she knows Dudley that the Professor unbends. He invites them home, and while there, he admits to his frustration of not having finished his book because he has nothing original to say. By the time his visitors leave however, the Professor is more hopeful. The Professor is not the only person who is charmed by Dudley. Debbie is very fond of him, and both Matilda, the maid, and Ms. Cassaway, the Bishop's secretary are drawn to their new visitor. Not to mention Julia. Henry is the only one who holds him distant - there is suspicion that Dudley is not who he says he is, there is jealousy that Julia seems much more happy now that Dudley is there to squire her around, there is still the cathedral to be built, and Mrs Hamilton to appease. Julia is visiting her husband's old parish - St Timothy's, where they are having a fundraiser, and Henry intends to be there with her. Only, a newly-varnished chair gets in the way of his plans. Reverend Miller is a bit abashed as choir seems to be missing quite a few members, but with a little help from Dudley, the rehearsal is quite a success. On the way back, they take a little detour - to the park, in the company of an irascible cab driver called Sylvester. Happy and tired, Julia returns home - to a very resentful husband. Dudley is unrepentant. He, Dudley would have gone to represent Henry at Mrs Hamilton's but Henry did not want him to; so he represented Henry with his wife. Henry is beginning to realise that his wife is happy again - and he is not the reason for her happiness. He has his cathedral now - and what do his principles matter if his dream can be fulfilled? - and he wants Dudley gone. Out of his house, out of his life, and away from Julia. Is it that simple? Will Dudley leave just because Henry wants him gone? Or does Dudley have another motive altogether? After all, he is beginning to be attracted to Julia. Is she as oblivious to it as she seems? And Mrs Hamilton - what does she really want? Will she give Henry the money for his cathedral as she promised? Or will Dudley drive a spoke into Henry's wheel again? Just who is Dudley? If he is an angel, why is he not helping Henry as he said he would? And has Henry lost not just his way as a Christian and a Bishop, but also his wife at the altar of his ambitions? Does he get his cathedral after all? Adapted from a novel (of the same name) by Robert Nathan, this Henry Koster-directed vehicle had its share of problems. The film originally cast David Niven as the angel, Dana Andrews as the Bishop and Teresa Wright as the bishop's wife. Then, Wright had to bow out due to pregnancy, and the studio loaned Andrews so they could borrow Loretta Young for the wife's role. Samuel Goldwyn did not like what William Seiter had shot until then, sacked him, and brought in Henry Koster. Koster began shooting from scratch, bringing in Cary Grant as the Bishop, until Grant, notoriously picky about his roles, decided he was better off playing the angel. So the roles switched between Grant and Niven. Then, when preview audiences didn't really like the film, Billy Wilder and Charles Brackett were brought in to rewrite some crucial scenes. The film picked up five Academy Award nominations, including one for Best Picture. It won an Oscar for Best Sound. What I liked about it is that despite the sweet sentimentality (as befitting a Christmas film) it really doesn't descend into soppy vapidity. The casting was pitch perfect and I'm glad that Grant chose to switch roles. He is perfectly angelic. (Add suave and dashing and almost impossibly handsome to the list. If an angel had to come to earth in answer to my prayers, and he looked like Cary Grant, I think my prayers would have been answered right then!.) It also helps that his chemistry with Loretta Young was fantastic. Word has it that the two squabbled all the time on the sets, because Young was frustrated by Grant's pickiness. None of that shows on the screen however, and their scenes together are some of the best in the film. Loretta Young looked absolutely beautiful and played her part as the sad, neglected wife with a quiet grace that defies even Grant at the end. She is romantic, she is vulnerable, she blossoms under Dudley's affection, there is even a bit of unspoken attraction, but he doesn't touch her heart - as is evident when Dudley offers to stay back if she asks him to. 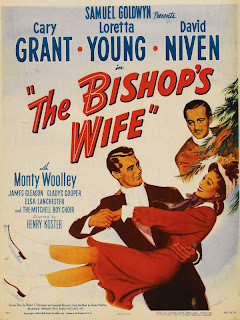 David Niven played the overstressed, overwrought, overworked Bishop who has lost his way, and then later, the husband who has suddenly woken up to the fact that his marriage is threatened, to perfection. They were supported by an ensemble cast that is very close to perfection. James Gleason is wonderful as the sympathetic Sylvester, while Gladys Cooper plays the arrogant Mrs Hamilton to the hilt. Unlike It's A Wonderful Life, which is another great Christmas movie, this one has an undercurrent of humour running right through it. The dialogues sparkle with impish humour, and it is as easy to smile through the film as it is to tear up. When Professor Wutheridge says 'God bless you' to Dudley, he offers to pass the recommendation on. Or when the Bishop asks Dudley if he is expecting a letter, Dudley remarks 'Well, you never know. If I did get one, the stamp would certainly be worth saving.' When Mrs Hamilton lays down her condition for helping Henry build the cathedral - the face of St George in the stained glass window should be that of her husband's - the beleaguered Bishop, who has put up with much so the cathedral would be built looks at her and deadpans: 'And who do you see as the dragon?' Or perhaps the films' one 'laugh-out' moment when Henry is stuck to a chair, when he should have been going to meet his wife. The skating scene is beautiful as is the boys' choir. The film is explicitly Christian, as may be expected when one of the characters is a Bishop, the other an angel and the whole film is based on one man's obsession to build a cathedral for the glory of God, but it refrains from pushing doctrines down your throat. In fact, despite the strong thread of Christianity running through the film, it is less about theological issues than it is about human relationships. More to the point, even an agnostic-veering-on-the-atheist like me found myself with a lump in my throat during that last sermon. If you believe in magic, watch this film. If you don't, I can almost guarantee that you will, by the end. If I had to nitpick, then it would be that Professor Wutheridge ends up in church at the end; was that necessary? But that is only a minor peeve about a movie that is so heartwarming, so engaging, so charming, so, so simple. It is a nice way to bring in the New Year. I've heard of The Bishop's Wife and had always been intrigued by the thought of Cary Grant playing an angel. But, frankly, after that spoiler - that he doesn't get the girl, even though he falls in love with her - I'm not sure I want to watch this. Especially not if it involves losing the girl to David Niven! Happy New Year to you too, Madhu. Think of this as a slightly different version of Anuradha, Madhu. :) After all, Julia is married to Henry. And she loves him. And angel or otherwise, why would she want another? It all boils down to choices, and it is a very, very charming film. What I liked was that even that scene where he sounds her out, it is so effectively done. Hmm. That is a point. But Cary Grant? And David Niven? Somehow, some sullen little part of me is saying, "The Swan? Will this be like The Swan?" It doesn't sound like it, so I'll put it on my to-get list. Maybe it's about time somebody started making the days 36 hours each. Otherwise, I'm never going to get through the list of films I have to watch and books I have to read. What do you have against David Niven, woman? *grin* And no, it is not at all like The Swan. Maybe it's about time somebody started making the days 36 hours each. I have given up on finding time to do everything I want to do. I find myself muttering 'WDIGTT?' under my breath every time I read a review of a film that I haven't seen - piles of DVDs stare accusingly at me from my shelves. So do my books. Sigh. WDIGTT? !